Nashville based Rock N Roll band The Soul Shakers, have released a music video for their debut single “Here to Have a Good Time” . The video, which originally premiered with Revolver Magazine, comes from the band’s upcoming full length LP. Here to Have a Good Time is available for purchase now online. After two years of writing in Los Angeles and then a move to Nashville, Hellingsand Reidy were ready to lay down the tracks for their forthcoming full length LP. The two flew to Philadelphia to record at Soundmine Recording Studios with producer Dan Malsch (Motionless in White, Tantric, Framing Hanley), featuring Chuck Treece from Bad Brains on drums. The result is a culmination of the diverse lives they’ve led and experiences they’ve had along the way. 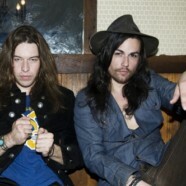 The band chose the track “Here To Have A Good Time” as their debut video, which was shot in and about their old Los Angeles stomping grounds with director Shane Drake (The Red Jumpsuit Apparatus, Taylor Swift, Panic! At the Disco) and is set to debut September 28, 2016 on Revolver.com.